Glow Med Spa is Richmond's premier day spa, offering advanced, medical, skin-changing facials and laser services, painless Brazilian bikini waxes and the most amazing massage experiences - all at a price that everyone can afford. Call for an appointment today. We look forward to helping you! 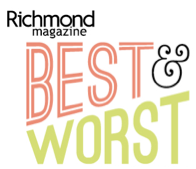 Awarded by Richmond Magazine for "Best Day Spa" EVERY YEAR since 2011. Come see why Glow Med Spa has been on the BEST list year after year!